Any election campaign is a mighty beast of a marketing challenge. From mere branding of the main banner campaign, or simply branding of the candidates, to detailed segmentation, profiling of state demographics and ultimately budgeting media buys and strategies vis-a-vis the projections, the whole campaign is a marketing exercise. 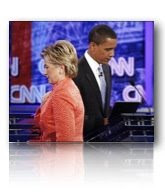 This is what got me very interested in the 2008 democractic primary battles between Hillary Clinton and Barrack Obama. It's a battle of wits. A battle of product qualities: on one hand one who is a "fighter" and another, a candidate of "change". These one-word associations that came to define their campaigns are not accidents - they are predetermined modes of character that aim to highlight the product. What's interesting is, as with any battle between competing brands, one will end up a clearer winner in the end. Somehow, Obama's largely Internet-based and new media campaigns have outpaced Clinton's. Could it be the young demographic that supports him which fueled the quick spread of his videos and speeches? Or is it merely a tactic that was not as exploited by the Clinton campaign? As it turns out, it's not just strategy but the message, something is new about the campaign, in the way it was managed like a community event, ground-up but on a nationwide scale. Is this success a question of the message (the product as it is 'essentially' placed, that is, "change") or is the success of the Obama campaign really due to the management behind the campaign. It's easy to attribute it to both, but which one has a bigger effect? Is it the money - Obama having more in his war chest? I remember from the book Freakonomics, however, that it isn't decidedly sure that once you have more money - you correlate that to winning an election (that's only half the story). Nedra Pickler, has an interesting article about the Obama team out-organizing their Clinton counterparts. There it's laid out how the Obama campaign has sustained the campaign (aka managed the funds) while Clinton had to lend her team her own money. 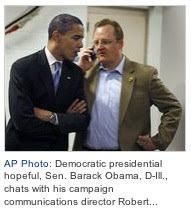 The article outlines the people behind the Obama campaign and talks about their key strengths. We've all come across the claim that a good product will sell itself. Or that one product if good enough will not require a lot of marketing but will largely advertise its own by sheer referral volume or popularity. Well guess what, I don't buy that. Not all online sensations for instance got big by sheer luck. You think there are no marketing teams behind such viral campaigns? There are companies that capitalize on the initial surges of such phenomena to sustain them and plan how to most efficiently schedule the exposures. And so I end with Obama's team. Much a great character he is whose message a lot will buy, you got to give it to his staff for making it happen. Certainly, he would have mark his leadership on key points in the campaign, the famous address on the issue of Rev. Jeremiah for instance, wherein he wrote his own speech. But ultimately, without the staff capitalizing on the grassroots movement and the enthusiasm of the supporters, and planning effectively, America would not have known that such a product call "change" was even available. Jdavies lives in Quezon City, Philippines and has been blogging since 2002. A brand manager in a leading technology company and a freelance new media/web strategy consultant, he has refocused his blogging from personal, political & sociological observations, to marketing-related efforts and Internet trends that are relevant to his career and branding advocacies. This blog is a depot of thoughts and observations on marketing trends which remain personally relevant to the Author as far as his marketing career is concerned. Having evolved from the personal blog of Jdavies, much of the earlier work contained herein are laced with personal speculation, political views, and similar advocacies. These posts are being kept for posterity's sake and for no other reason. No effort is being made to claim that the author will not contradict himself from his previous positions or that such advocacies are absolute. Why the Philippines is getting Poorer?